1. The following circuit shows a simple but useful example of an active mixer. The NE602 IC includes an on-chip oscillator but has a fairly limited dynamic range. It may be used as a building block for more complex applications including a product detector and balanced modulator with appropriate circuit changes. The above circuit shows the RF input being single ended. Balanced input is also possible by removing the decoupling from pin 2 and feeding a push-pull signal to pins 1 and 2 which will result in improved second order and higher even order products. These pins are internally biased. The impedances between pin 1 to pin 3 and pin 2 to pin 3 are typically 1K5 ohms in parallel with 3pF. C1 and T1 should resonate at the desired IF. 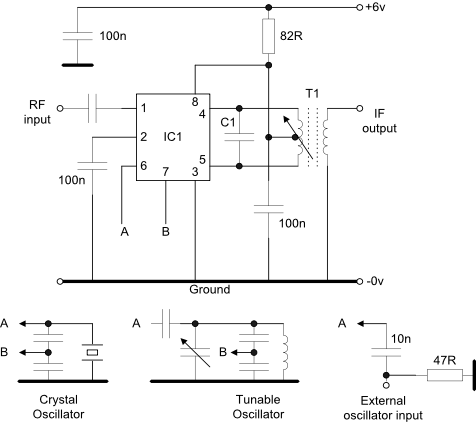 The turns ratio for tuned transformer T1 will be determined by the impedance of the following stage. The NE602 has 1K5 internal resistors between pins 4 - 8 and 5 - 8 so a low LC ratio will be required. Conversion gain should be of the order of 14-17dB but this will depend on the exact values used for C1 and T1. If an external oscillator is to be used then the 47ohm resistor is provided to ensure that the NE602 internal oscillator is prevented from operating. Users should ensure that this is the case. External injection should be at least 200mV pk-pk. The third order intercept point for the NE602 is typically -13dBm. The SA602 may be used in place of the NE602.